There has been some unhealthy long periods of silence between my posts lately. The usual reason, commissioned work has kept me a busy bee. CG artists need to make a living as well – bills, bills and bills – unfortunately. Some of my paid gigs are interesting and challenging though – gives me opportunities to tune my skills and dive into creating pieces using all my arsenal of CG tools which I might not have gotten into if I only worked with my personal projects. But still, some of the things I have planned to do for myself I really long to do. I’m working on a solution to switch between gigs and personal projects more freely, which seems to actually work out and become reality. Anyway, I’ll probably be able to get back into posting regularly again, at least a few times a week. Starting from today. So now I don’t have any choice to not post, do I? Even though my postings have been sparse I’ve spent a lot of my free time working on my projects. One of my different short films and animation projects have progressed rapidly, and I registered a new domain name for it a few days back, so it’s getting ready to be revealed real soon. Just a few weeks away for the initial release. I’ve also been working a lot with my CG character development. Updates to those will be posted shortly. Just a quickie to go with this post to not make it completely boring without any images. A CG chick I’ve been trying out some things with in the last days. Modeling and sculpting is finished, currently working with textures and some hair guide styling. 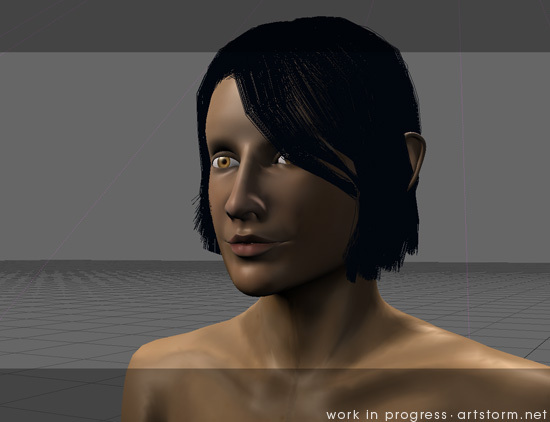 A quick screenshot from the OpenGL view in LightWave with a temporary texture I’ve painted and the beginning of my hair guide styling. Posting to be continued in the next days…. It’s always hard to get back to doing personal projects when you still have to get money into the back account. Unfortunatly, my job has taken priority so many times that i’ve lost steam… How do you keep motivated after finishing a paid gig? Actually, motivation is not really a problem, but get up to speed on all assets again can be quite a daunting task when returning to an old project. Tons of half finished textures, different model versions, bunches of different test setups etc etc. Perhaps says more about my organizing of files (or lack there of). An order that made sense when working with it the last time, but a few weeks or months later it’s a challenge remember everything. I can easily spend like a day just browsing through a project – deleting and renaming things – before getting back working with it. Annoying!